The parent-child relationship is the child’s first social relationship. It is an important one. A child’s first important relationship with his or her mother starts to develop even before birth. 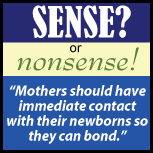 So, is immediate contact with a newborn necessary in order for a mother and child to develop a life long bond? There was a movement in the 60’s and 70’s in which people believed in a biological process that they called “bonding”. Bonding was meant to be a strong, biologically-based emotional connection that arose between a newborn and his or her mother during the first hours of life. Bonding was thought to be a kind of instinctual process. If a mother was able to establish a bond during the time after birth, she would be more likely to love and care for the baby throughout childhood. This type of idea came about, in part, by observing animals (often mice) whose caregiving behavior is more strongly regulated by hormonal processes. But bonding doesn’t exist. Studies show that there is no instinctual process that brings mothers and babies together. Instead, there is a process — psychologists call it attachment — that does occur. But this develops over the first months and years of an infant’s life, primarily as a result of sensitive caregiving provided by an adult. Attachment is an emotional relationship that develops over time between a caregiver and a child. In an optimal attachment relationship, as a result of having a responsive and empathic caregiver, children come to experience their caregivers as helpful, trusting and loving. Children learn to use their caregivers as a “secure base” from which they can explore the world. If a child feels fearful or wary in an unfamiliar context (say, when visiting a friend’s house), he or she will stay near the caregiver in order to feel secure. A sensitive caregiver might gradually introduce the child to the unfamiliar setting (perhaps by calming point out toys that might be fun to play with). As the child feels that it is safe to leave mom’s protective sphere, he or she may begin to explore her world, knowing that mom will be there if things go wrong. The concept of bonding (not attachment) is actually a kind of dangerous one. There are mothers who do not feel a surging sense of love and connection toward their newborns. This can happen for many reasons. Childbirth is not a particularly easy process. If an exhausted, depressed or simply slow-to-warm-up mother were led to believe that she is supposed to feel intense feelings of love and connection toward her newborn, she might wonder what was wrong with her if she did not experience these feelings. The answer: Nothing is necessarily wrong. Give it time. And so, sense or nonsense? Attachment? Sense. Bonding? Nonsense!